It is that time of the year when the roads and colonies in Bangalore will host Ganesha Chaturthi celebrations. Though one believes in God or not, such events add colour to the otherwise monotonous life, and bring the families and friends together together in the name of celebration. However, the Ganesha idols, especially the big ones, are made up of Plaster of Paris, which is a non-biodegradable substance. Add to that the lead-based paint that gives a glossy look and feel to the idol. In the name of celebration, we pollute the water bodies when we immerse such Ganeshas in nearby lakes or rivers. To reduce the piling up of waste near markets and water bodies, the Karnataka State Pollution Control Board and Bruhat Bangalore Mahanagara Palike have been promoting the usage of eco- friendly elephant god. This year too they have issued some guidelines. These guidelines are necessary to ensure that Namma Bengaluru is clean and green. An eco- friendly Ganesha is made of raw earth (Sadhu clay, Jedi mannu) or plain clay which is not mixed with chemicals. It is just mud and water. These when immersed in water or let to nature, just get dissolved without releasing any toxic materials. Another type of eco-friendly Ganesha is made of straw, husk, jute sacks and other biodegradable raw materials. Such types are usually not made in Karnataka, but brought from Mumbai, says Shalini, cultural ambassador of Culture Trails. A press release issued by KSPCB says that the attractive idols of Lord Ganapathi are ones which have synthetic colours used on them. These colours contain heavy metals like lead, chromium, manganese and many other harmful toxic chemicals which harm the environment. A two kg idol of painted with lead-based paints leaks around two grams of lead into water. Large statues of Ganapathi are made of Plaster of Paris which most of the times is contaminated with asbestos which leaks into the environment. Asbestos is considered to be a carcinogenic substance. Thus it is advisable to use small statues measuring around 12-14 inches, which are made of clay. Uncoloured idols are the best, because when the idol is decorated, the absence of colour will not be noticed. If people want to use colour, they should buy the idols that use organic, vegetable colours or natural dyes. The glossy colours should be avoided as they have heavy metal contents in them. The KSPCB requests citizens not to immerse large idols. Large idols could be exchanged for the new ones next year, or could be re-used. For immersion, a representative small idol can be used. KSPCB appeals people not to immerse idols and dispose puja articles into drinking water bodies like wells, ponds, lakes and others. Residents are requested to immerse the idols of their homes in a bucket of water to avoid rush on the streets and kalyanis. Also. the usage of crackers and loudspeakers is prohibited from 10pm to 6am. Citizens can visit KSPCB’s Facebook Page for details. She however adds that while making large idols, plaster of Paris is used because if it is made of only clay, it could break. The price range for an eco-Ganesha ranges from Rs 100 (for an uncoloured one) to Rs 5000 (for a big coloured Ganesha measuring upto 3-4 feet). The maximum height of an eco- Ganesha idol is four feet. Shalini points that the best way to identify a non-ecofriendly Ganesha (made of Plaster of Paris) is to check the weight. It is very light to carry and has bright colours on it. One made with clay is heavy and will have a slight dull appearance. The eco- Ganesha would also not have a fancy appearance, they would be simple and earthy looking. 1. 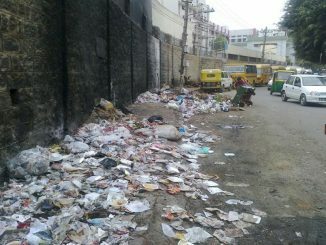 The corporation has requested citizens not to use any types of plastic bags which damage environment. 2. Non-harmful colours should be used on the idols, so that when they are immersed in lakes, they do not harm the environment. Use organic colours on clay Ganesha idols. 3. During the festival, citizens are requested not to litter the streets with puja articles, garbage and plastic. 4. Commuters should stop their vehicles on the road sides and walk with the idol to the designated lakes for idol immersions. 5. The BBMP has identified 32 places for idol immersions, which include Sankey Tank, Yediyur lake, Ulsoor lake and Saneguruvanahalli lake. Kalyanis have been made for made for idol immersion, in most of the renovated lakes. 6. For the convenience of the locals, 88 mobile immersion vans will also ply across the city and stand at strategic locations. Idols of all sizes can be immersed in these units to reduce traffic at the kalyanis. 7. Idols should be immersed in the Kalyanis only, not in any other part of the lake. Adequate lighting is being provided around the kalyanis for their easy identification. 8. All puja articles including flowers, mango leaves and so on should be handed over to the person at the collection centre near the gate. Do not dispose them in water. 9. Bursting of crackers on the road and taking the idols to the kalyanis after 10.30 pm will not be entertained by the BBMP. 10. Bursting of crackers near the lake during idol immersion is prohibited. 11. Trained swimmers along with staff members of the corporation will be present near the lakes and the idol immersion vans for the help of the citizens. They will be wearing the BBMP logo on their dress for easy identification. 12. Volunteers from the neighbouring localities will also be assigned for helping the BBMP and the public. 13. Residents are requested to identify a suitable date, time and location for immersion of large idols. This will ensure law and order and safety of the people. They eco-friendly idol of the elephant god is available everywhere in Bangalore. Some shops where you get them are The Living Store in Chamrajpet, Ojis Nisarga in Basavanagudi, Sahakaranagar in Kodigehalli, Mother Earth in Royal Meenakshi Mall and in Mantri Mall. The roadside vendors in Gandhi Bazaar, Malleshwaram and many other places too have uncoloured clay idols of Ganesha. These can be coloured with organic colours, according to your taste. Epics say that Ganesha’s mother, Parvathi, prepared a clay doll, gave life to it and called it Ganesha. Make this Chaturthi memorable with clay idols of Ganesha, to retain the tradition and contribute to a non-polluting celebration. Even if you aren’t celebrating, spread the word in your neighbourhood. The survey shows that most respondents don’t care for the candidate’s party or caste. What does the voter of Bengaluru think about the corporators? Read on. Wildlife Conservation Group is organising a workshop to record the various trees on Bannerghatta Road. I hope Citizen Matters will also similarly advise people to celebrate ‘Eco-friendly’ Bakrid and advise people not to indulge in inhumane killing of innocent animals.